Seasonal Allergies Making you Sneeze INSIDE your Home? It’s that time of year again when many of us start sneezing, wheezing and blowing! One of the biggest culprits is ragweed pollen. The plant may only live for one season, but one plant can produce up to 1 billion pollen grains that are light weight and “float” thru the air. Can Those Pollens Get In My Home? According to a survey by the American Academy of Allergies Asthma Immunology, the answer is yes! It has been shown that more than 50% of homes have at least 6 detectable allergens present in their home. By cleaning your carpet and upholstery, you can greatly reduce the amount of allergens that have become trapped inside your home. Some think it’s a good idea to tear out carpet, but for allergy sufferers, carpet can actually help reduce the allergens in the air by trapping them in the carpet fibers. If you clean and sanitize on a regular basis, you can greatly reduce your allergy symptoms since the carpet is capturing the air borne allergens and confining them. Once you clean the carpets and upholstery, you are reducing the allergens in the home! Our cherished pets can also contribute to our allergies. Unfortunately most dogs and cats will shed some dander and fur through your home. Proper and frequent vacuuming will help keep this at bay, but over time the dander and fur can gather on carpet and furniture and will need to be properly cleaned. Between the pollen and the animal dander, your home can become over saturated with allergens, and the air quality in your home will decrease. By properly cleaning your “soft” fabric (carpet and upholstery), the air quality in your home will be better. 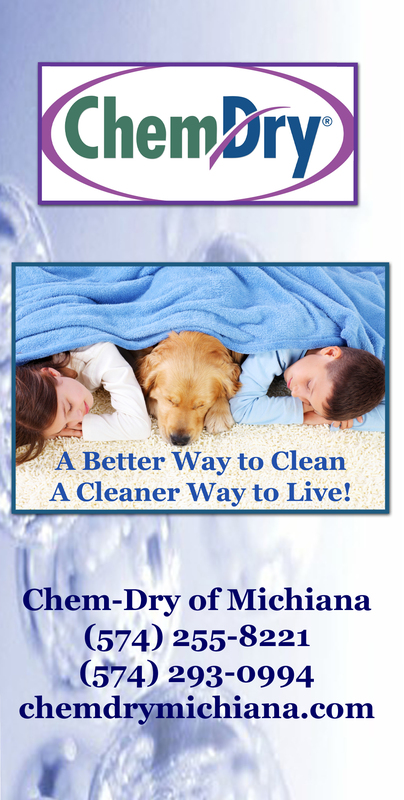 Our team at Chem-Dry of Michiana can help properly and effectively clean and sanitize to help rid your home of these allergens. Give us a call and inquire about our cleaning and the anti-allergens we have available. This entry was posted in Allergy Relief, Chem-Dry Services, Maintaining a Healthy Home and tagged allergy relief, carpet cleaning, seasonal allergies, upholstery cleaning. Bookmark the permalink.